ST. PAUL (June, 2014) – U.S. based Skyline Exhibits, a leading designer and producer of exhibits and graphics for trade shows and marketing events, has reached a distribution agreement with the global event display company Expand International AB, Stockholm – Sweden, to promote and distribute the new Skyline® WindScape® Exhibit System outside of the U.S. and Canada. Skyline dealers in the U.S. and Canada will continue to distribute the new product exclusively in their respective countries. Throughout the rest of the world, the product will be distributed by Skyline’s global network of dealers along with the Expand network, which consists of customers in more than 60 countries. “WindScape® launched nearly a year ago and market adoption has exceeded our high expectations,” stated Bill Dierberger, President, Skyline Exhibits. “We are excited to bring this new – and proven – technology to even more exhibitors around the world through the Expand network.” Both companies will continue to independently distribute their other products. 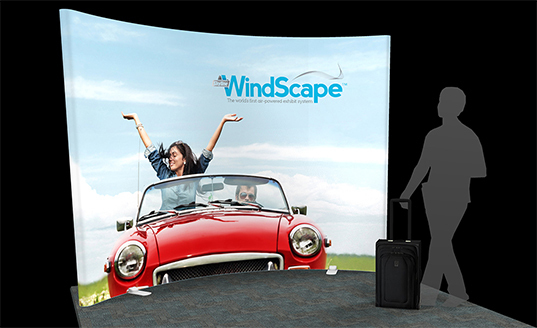 Skyline® WindScape® is the world’s first air-powered exhibit system. Frames are inflated with the push of a single button rather than assembled like traditional exhibit systems. Customized, double-sided fabric graphics come pre-attached so installation is quick and easy. A 10-foot backwall display goes from case to exhibit ready in under 7 minutes, with no tools. Skyline WindScape currently has 46 shapes ranging from a tabletop display and a variety of 10-foot backwalls to larger conference rooms and 16-foot diameter hanging structures. Including the inflator, the tabletop model fits in a backpack, while a 10-foot backwall display fits in a carry-on case stowable in a plane’s overhead bin.